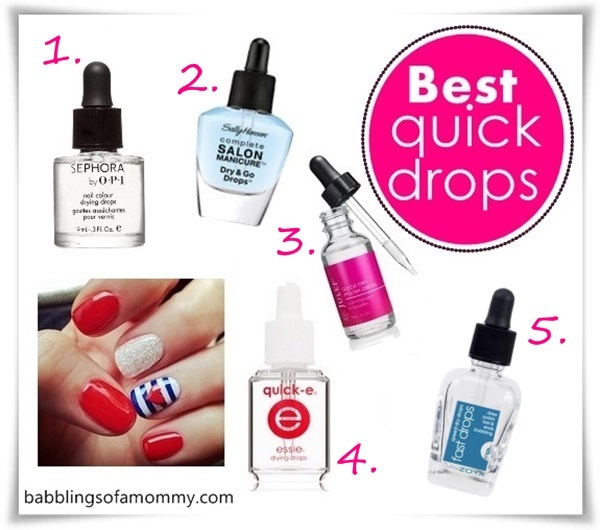 Babblings of a Mommy: Best Quick Nail Dry Drops - For The Perfect Manicure! Best Quick Nail Dry Drops - For The Perfect Manicure! At-home manicures are quick, easy, and affordable - but the drying time can be painfully frustrating! We all know smudges, nicks, and scratches occur when we don't allow our nails to fully dry, but being completely hands-free for 2 hours is unacceptable! So what do we do when air drying just isn't cutting it? Well, to remedy this our favorite mani brands have come up with a variety of quick drying products, but my favorite happen to be nail drops. They are very easy to use and are quite effective in my opinion! If you've never used dry drops before I would suggest you place a towel underneath your hands before application since some of the product might drip down. Without further ado - here are my favorite quick nail drops, including the one I swear by the most!